You are here: Home / SQL Tutorial / SQL AVG(): How to use AVG() function? 3.1 What we learned about SQL AVG() function? 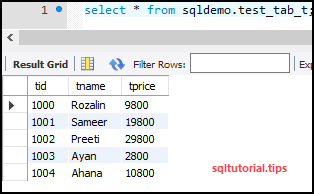 The SQL AVG() function works with a bunch of rows of a column in a table and finds the average of it. Let us say we want to find the average tprice in the table. So, Let us calculate the average of the tprice column first, then we will try to find that with the query. SQL AVG(): How to find the average in SQL? What we learned about SQL AVG() function? We learned that the SQL AVG() function finds the average of all the values in a column of a table. It takes column name or expression as an input parameter.